Herb or fruit infused oil can add a flavorsome twist to salads, pasta dishes or crusty home made bread. Infused oil packaged in an attractive Typhoon drizzler will make a lovely gift for friends or family. 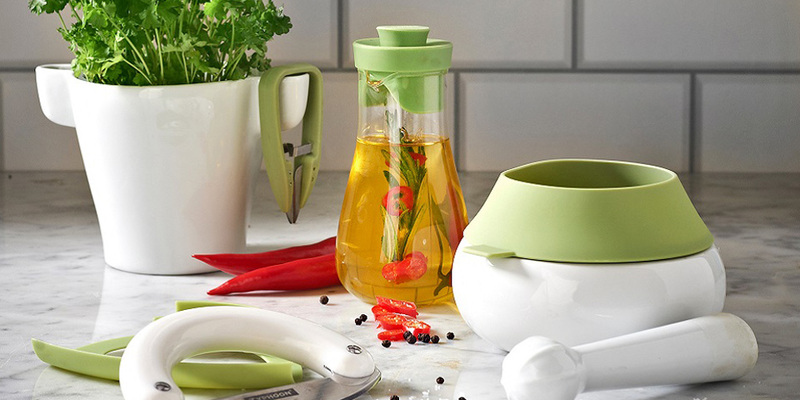 The Typhoon Seasonings Oil Infuser is a stylish way to infuse oil and features a silicone bung to ensure that oil is kept fresh. 1. Wash and thoroughly dry all ingredients*. 2. Wash the oil infuser in hot soapy water before first use. Ensure the oil infuser is thoroughly dry before adding oil to avoid spoilage. 3. ruise any herbs that you will be adding by either gently pressing on them with the back of a knife or using a pestle & mortar. 4. Lightly toast or crush any spices in a pestle & mortar. 5. Thinly slice any fruits that you may be using such as lemon or chilli. 6. Add ingredients to the infuser section of the oil bottle then fill with oil. 7. Seal and infuse in a cool dark place for 1-2 weeks before using. 8. Remove the solids from the infuser and store the bottle in the refrigerator for up to two weeks. Alternatively you can heat the oil and the herbs or spices in a pan on the hob which will help the ingredients infuse more quickly. Simply cook on a low heat for 20 minutes stirring occasionally. Remove from the heat and cool before pouring into a sterilized bottle. There are so many flavor combinations to choose from but here are a few of our favorites. Simply follow one of the methods above to infuse them into the oil. * If the ingredients aren’t dried properly there is a risk of mold or bacteria growing in the oil, so this step is very important.